In November 1971, at the request of the European Confederation of Agriculture, FAO'S member governments supported the annual observance of 21 March as World Forestry Day. Since then many nations have adopted this practice. In schools and public buildings in Nigeria, World Forestry Day posters appeared calling attention to "Our Forest Heritage." In the United States, a presidential proclamation marked World Forestry Day as part of a week of activities and ceremonies about the role of the forest and forestry in every man's life. In Australia, a national committee representing states, territories, universities and timber producers launched a campaign which included distribution of free booklets (Forests are forever; Forestry, the environmentally compatible industry) and a 15-minute television film. 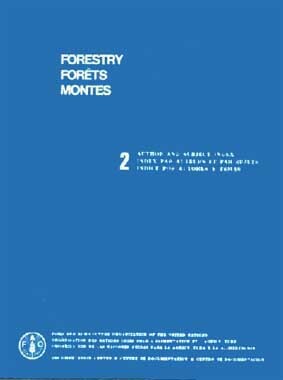 In multilingual Switzerland, the press, radio and television, encouraged and assisted by the information services of the state forest service, described in French, German and Italian the important role played by forests and forestry in the economy, in the protection and conservation of the environment, and in the mountain heritage and culture of the Swiss people. Forestry, more than other branches of agriculture, is an activity which needs to be brought before the public, as is well noted in the article entitled "Explaining forestry to forest users". But to make the practices and benefits of forestry comprehensible to the public is not as simple as it may at first seem. This is partly because of the long time scale involved in forest management compared to the increasingly rapid pace which modern man has come to accept as normal in so many other activities. In some countries there is also a residue of public suspicion of foresters as the "policemen of the woods" and this has to be overcome. Every forester appreciates and understands the value of the forest as a source of raw material, as a provider of local employment and national income, as the great sponge which gathers and releases water, as the habitat for flora and fauna that otherwise would become extinct, and as the environment and atmosphere in which man feels uniquely at home with nature. If foresters and forest services talk in plain language about that which they know best, people will listen, understand and be with them. Sir Frank Fraser Darling rightly says: "Man is weaned of the forest, and yet the forest is still very much a part of us." This is at the root of the concern of so many people today for the preservation of forests and other natural environments. We would like to know about the various kinds of World Forestry Day activities in different countries so as to better communicate ideas among them. Those in charge of such activities should send samples of their efforts - posters, booklets, press cuttings, photographs and films - to unasylva. FAO congratulates and supports the European Confederation of Agriculture in its efforts to promote World Forestry Day. Shifting cultivation, the oldest system of farming still widely practiced, is destroying forests, degrading land and causing erosion in many parts of the world on a vast scale. There are an estimated 3.6 thousand million hectares currently under shifting cultivation throughout the world and it is believed that some 250 million persons live by it. The situation is particularly serious in countries where there is population pressure on the land, such as in the tropics of Asia. This is a problem of historic importance in which food production and forest management are the interlocked elements and, it is widely felt, the foresters have the key. As is shown in the article by Krit Samapuddhi of Thailand (page 20) and the report from the Philippines by Rifat Alwi (page 22), agri-silvicultural methods - taungya and its variations-are providing viable working alternatives to uncontrolled slash-and-burn agriculture. In various ways agri-silviculture seeks to create harmony between crop farming and tree farming. Both reports point out that agri-silviculture is not easy and does not always work. Patient, flexible, intelligent administrators with an understanding and sympathy for the farmers of the forest, their traditions and their human needs, are among the most important elements for the success of any system of agri-silviculture. At a time where there is an awareness throughout the world of the serious imbalance between food production and distribution and population increases, there should be much more research and practical work on agri-silviculture for tropical countries. As foresters we should also spread an awareness of the imbalance between the vast areas of the tropics which are being devastated by unchecked slash-and-burn cultivation and the relatively small areas where agri-silviculture is being practiced, and in good part successfully practiced. The latter can and should be greatly increased. Forest services in tropical countries and university faculties specializing in tropical forestry should concentrate more resources and efforts in these directions. Are you looking for FAO documents on forestry? 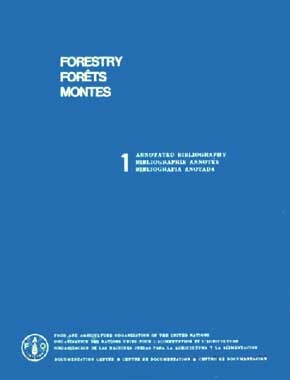 Publications and documents for the period 1967-73 covering forestry, forest industries, forestry education, administration, environment, wildlife and related forestry subjects. From these basic reference books you can order the actual publications and documents.